The Champion G5 PG710 is a commercial quality masticating juicer which can be categorized as a high-end kitchen appliance. This unit works by squeezing and dicing the produce, thus eliminating the nutrient damaging heat associated with centrifugal units. This is a powerful and durable machine which is designed for those who are serious about their juicing. As mentioned, a masticating juicer such as this Champion G5 PG710 has a significant advantage over centrifugal machines. Since the juice extraction process involves dicing and squeezing the fruits and vegetable, it does not cause heat buildup which reduces both nutrients and shelf life for the juice. Although this is a slower juicing process (5 to 10 minutes), it gets much better results for those who are looking to get the most out of their juice. Being a high-end commercial unit, the G5 PG710 is capable of many functions not afforded to most juicers. In addition to its prolific juicing capability, this unit homogenizes the extract when utilized with the included blank screen attachment. The blank screen is also ideal for making ice cream, sorbet, nut butter and to puree fruits that are soft textured. For those who will be creating product in bulk, the Champion G5 PG710 also has a homogenizing attachment which is sold separately. Also available for this versatile machine is a mill attachment which can be used to produce flour and grind coffee beans, among other uses. 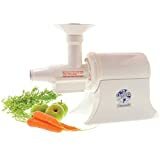 Unfortunately, you will also need to purchase another attachment if you will be using it for leafy greens since it does not do a good job of extracting juice from them as is. If you intend on permanently situating this unit on your kitchen countertop, it showcases an attractive modern shiny black body. Along with its aesthetically pleasing looks, this makes it easy to clean and prevents any damaging corrosion. This machine is driven by a 650-watt motor which has a one third horsepower output. This adds to its uncompromised durability, ensuring that it will last for quite some time. It also runs at a rather high 1,725 RPMs, which means you will likely have more pulp than slower juicers when juicing greens. If this creates an issue with your juicing needs, a slower machine may be a better fit. Coming in at a rather high retail price of approximately $350.00 (plus the cost of attachments), the Champion G5 PG710 is obviously not for those who are looking for a basic machine. However, if you do take your juicing seriously and are looking for optimum product quality and versatility, this machine is worth looking into. It has the ability and durability to be used often, such as that which is required for commercial purposes.